Multiple sclerosis affects neurons, the cells of the brain and spinal cord that carry information, create thought and perception, and allow the brain to control the body. Surrounding many of these neurons is a fatty layer known as the myelin sheath, which helps neurons carry electrical signals. MS causes gradual destruction of myelin (demyelination) and transection of neuron axons in patches throughout the brain and spinal cord. When the myelin is destroyed, the neurons can no longer effectively conduct their electrical signals. 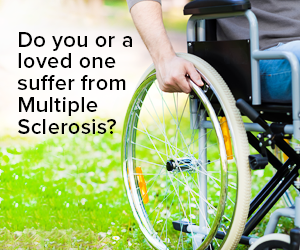 The name multiple sclerosis refers to the multiple scars (or scleroses) on the myelin sheaths. This scarring causes symptoms which vary widely depending upon which signals are interrupted.